People often wonder how seemingly ordinary or untalented people rise from nowhere and become superstars overnight. The same is true for the plethora of undesirable politicians who infest both parties; and yet the public is duped into re-electing them over and over again if for no other reason; they are disheartened that there are no better choices… and… the media puts their full backing behind the “sellout slime”. Sellout slime you say? Yes, obviously there are many talented and hard working people all over the world who innovate and make their ideas or businesses succeed through their own works and sheer creativity. But what about the super rich? What about the elite? Do you or I, no matter our amount of success, ever reach the ranks of the super elite? When Thorstein Veblen wrote his seminal work, “Theory of the Leisure Class” in 1899, people laughed at his musings but there is always truth in humor; otherwise it simply wouldn’t be funny. Veblen argued for a phenomenon called conspicuous consumption. The idea is most easily described as such: If a millionaire goes out and buys a Mercedes-Benz, this is accepted among his peers. However, if a warehouse laborer buys a luxury car, said laborer would be scoffed at by the higher class- he would not be accepted as legitimate even though on its face value, he would be driving a luxury car- just like the millionaire’s. So how do you make the jump from wealthy individual or talented artist to “world famous” power broker or superstar? You sell your soul. The oldest form of worship on Earth would be reverence for the most high God. But the second oldest, as described thoroughly throughout the Book of Enoch, the Bible, and many other sources, would be the worship of the fallen one and his fallen angels. This religion first reared its head prior to the great flood (it was also in large part the reason for the flood) and afterwards. Afterwards, it began in Sumer (Sumeria) with the pantheon of Sumerian, Akkadian, and later Babylonian deities who over time would see their worship spread to Egypt (Ra, Osiris, Isis etc. ), Greece (Zeus, Apollo, Athena), Rome (Jupiter, Apollo, Minerva), India, Central America, and many other places. The occultist symbols of this religion remain fluid throughout the various cultures they transcend, often times consisting of pyramids, stars, obelisks, etc.) It is through this symbolism and understanding that we address the beliefs of Freemasonry, which draws its origins from Ancient Egyptian customs, but in reality is more ancient- as drawing their Gods, symbols, and ceremonies directly from the teachings of the Sumerian deity “Enki”, who in Egypt was called Ra. This is the religion of the fallen one. You have no salvation and your worth is judged upon your works and adherence to ceremonies and rituals. Though this “religion” poses in many forms, often “new age” doctrines that in reality are very “old age” beliefs, its commonalities focus on one’s own happiness above all else, attainment of “wisdom”, and a plethora of spiritual ceremonial requirements. The catch being, as trumpeted by occultist champions like Albert Pike and Madame Blavatsky, the one who grants you this wisdom and guides your ascent through the heavens after death is… none other than the one who “illuminates” the material world with his wisdom… Lucifer. So if you want to ascend through the heavens after death and in the best case scenario, reincarnate here, back on the Earth as an even more successful person in another life, you’re going to need Lucifer to help you do this. This opens up a whole new “can of worms” and is the basis for the process of illumination in the occultist’s mindset. But the leadership of the world in large part are followers of these beliefs. How can I make this claim? It would take an infinitude of time to go on writing about every single example, but we will consider this accusation by reviewing one case study at this point in time; the no less than miraculous rise of the world’s most futuristic capital city in the most unlikely of places…. Astana, Kazakhstan. In 1991 after gaining independence from the defunct USSR, Nursultan Nazarbayev became the first president of the Republic of Kazakhstan. Nazarbayev has remained president ever since, most recently being re-elected to another 5 year term by gaining over 94% of the vote. 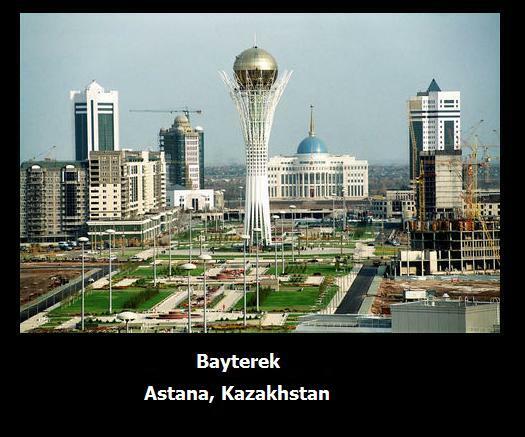 Kazakhstan might seem like an unlikely locale for a futuristic ultra masonic themed capital city, but the central Asian nation boasts an insurmountable wealth of oil and the money that comes with it. In come the international development bankers and massive new infrastructure expansion projects and what do you get? A brand new capital city! In 1998, the capital was moved from the nation’s largest city of Almaty to Astana. 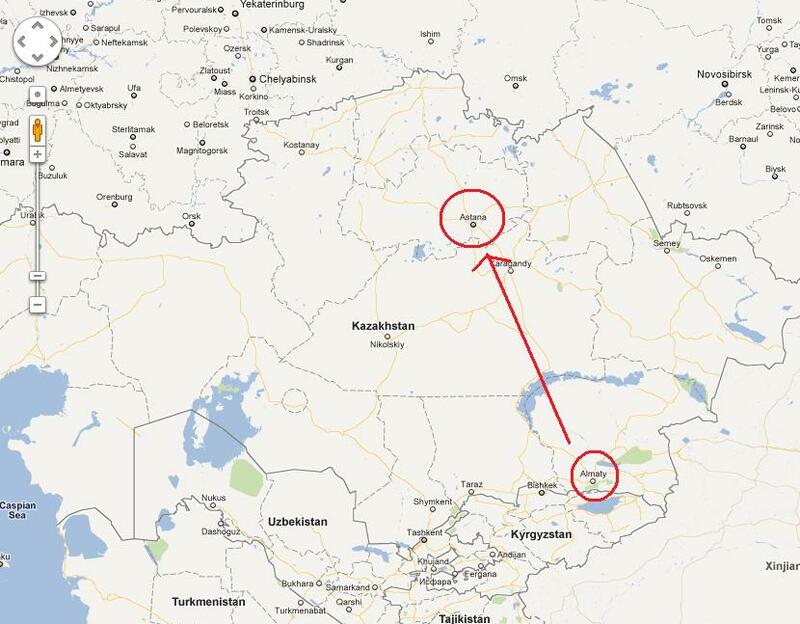 The reasoning for the move is a little ambiguous but the official reasons given were that Almaty ran out of room to grow and was too close to the border, whereas Astana would be more centrally located and unify the Russian north of the country with the more ethnic Kazakh south. 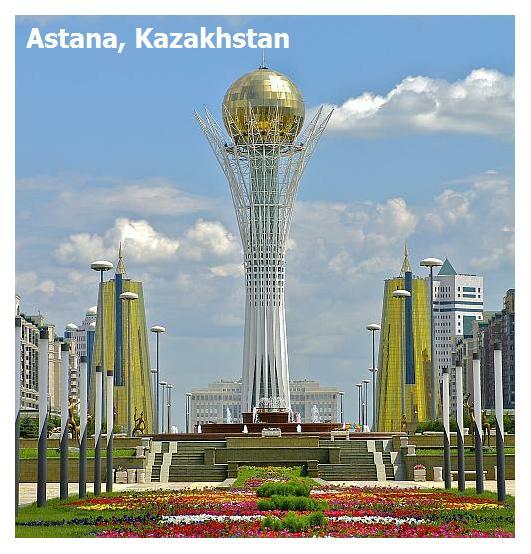 The construction of Astana was commissioned in 1998, and it has been a construction project of epic proportions ever since. British architect Norman Foster was commissioned to design many of the new age buildings to grace the city- and alternatively bring the viewpoints of Nursultan Nazarbayev (and/ or his elitist global banking cartel backers) to life. As we will see, the new buildings, all of which exhibit a common theme, are striking examples of the masonic dogma and Luciferian beliefs. Its unclear when Nazarbayev was seduced by the lore of the occult as his background prior to becoming the Kazakh president was as an upper tier communist party official, but the elite no less controlled Soviet Russia than they do control the west… simply two branches of the same tree, beholden to the same international banking system. Control the money, and consequently control the world. After the great flood, the Sumerian “deities” maintained a direct rule over the populace, but after the bronze age “dark age” which occurred at the same time that the Bible tells us God wiped out Saddam and Gomorrah, the lands east of Canaan including the whole of Mesopotamia (Sumer, Akkad, etc.) experienced what the old Sumerian texts called an “evil wind”- which decimated the population of the region. At this point, the Sumerian texts recovered from Ashurbanipal’s own library tell us that the “Gods” proclaimed that the “kingship would be lowered from heaven”; and consequently the fallen one and his angels would run the show from behind the scenes while men would appear to be the rulers over other men. And now with this decree, we have the initiation of the secret societies of men who control money and nations who in realty worship and consort with the fallen one and his minions in order to… in the end, bring back the order of old (as it was before the flood… or as the Bible tells us, “as it was in the days of Noah”). 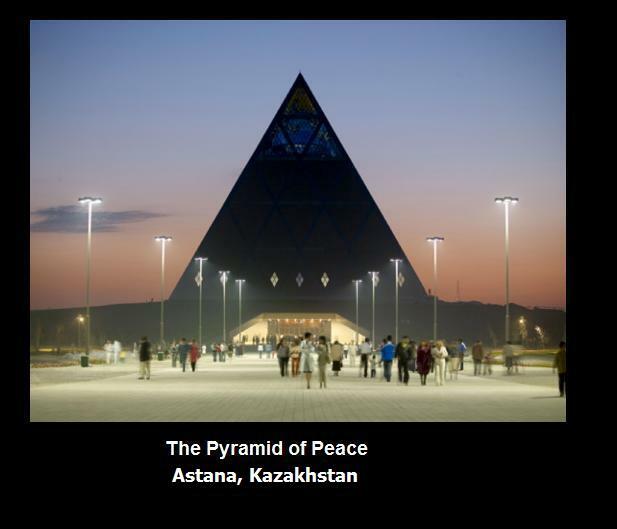 And now, back to Astana… the buildings designed by Norman Foster do not pretend to hide their masonic inclinations. Conversely, they proudly proclaim them for all the world to see and postulate over their magnificence. 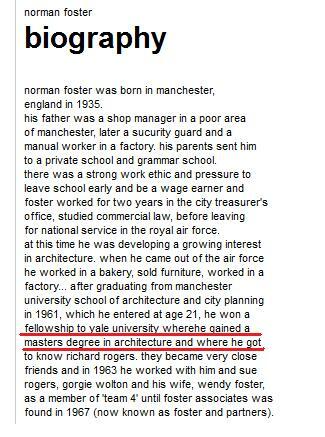 But Norman Foster at first appears to be a man of humble beginnings, growing up in Manchester, England, serving in the British Air Force, and later becoming a student of architecture; where on Earth did he gain his, what must be profound understandings, of the esoteric teachings? Though I cannot answer this conclusively, I suggest it was when he later attended Yale University upon being awarded a fellowship. Yale has long been a bastion of education and grooming for those who will later shape the world- not in so much as it is an esteemed institution of higher learning; but because of its infestation of secret societies; such as the Skull and Bones society- of which George Bush Sr., George Bush number 2, and John Kerry were all members. This is not by coincidence. I suggest that it could have been here, at Yale, that Foster gained his understanding of the esoteric teachings. 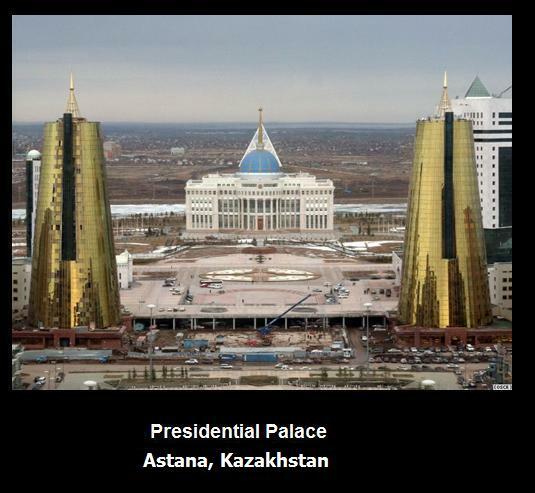 We see here the presidential palace of Kazakhstan topped by a dome and spire reaching upward to the heavens. Distinctly behind it is what is called “The Pyramid of Peace”, and in the foreground both on the left and right are two golden towers- physical representations of the two pillars of masonry- Jachin and Boaz. These pillars, the mason’s claim, were the two main pillars in the temple of Salomon. This claim is very likely true, as we know that toward the end of his life, Salomon began to worship the same Sumerian “Gods” appointed by the fallen one- so it would not be surprising that the followers of the religion of the fallen one would draw some significance in their symbolism from what was supposed to be divine and pure- but what was later tarnished. Salomon would later become a champion of the occult and is affirmed as much in the Bible as he is by various occultist writings. This theme of creation of a pure and good entity by the one true God, later to be hijacked in part by the fallen one is a reoccurring theme throughout all of human history. Salomon’s own life is a microcosm of this phenomenon. The most high God creates it, and the fallen one corrupts it! On to the next building… The Pyramid of Peace! The pyramid is one of the most popular occultist symbols for a variety of reasons ranging from its perfect geometry to its esoteric symbolism regarding the struggle of man. In the esoteric belief, the ground symbolizes death- or the animal instinct from which the illuminated individual must emerge. It can most effectively be compared to Plato’s allegory of the cave, where those chained in the cave represent the masses- who in the pyramid symbolism would be in the pyramid’s base, closer to the ground. In the words of the Occupy Wall Street people, 99% of the sheeple are in the dark- in the ground, and at the base of the pyramid. We are in the base of the pyramid because we are held hostage to our more animalistic desires; greed, lust, jealousy, etc. Therefore, it should not surprise us that in the base of this pyramid lies an opera house- a place where the masses can be entertained and embellished with fulfillment of their Earthly desire for entertainment. The middle portion of the pyramid is bright and filled with natural light, and the apex is transparent with the abstract representation of a golden deity shining above an observer looking up- focusing the observer toward the illuminated heavens- toward the sun- or toward Lucifer- the provider of wisdom. In the esoteric teaching, the individual should progress from the base of the pyramid where he lies mired in darkness and ignorance toward the apex, where he becomes illuminated with the wisdom of the universe and immersed in light. We are told that it is a representation of a folk tail where a mythical bird lays his egg in the top of a tree. However, this building clearly represents the esoteric view towards the tree of life in the Garden of Eden. Within Christian doctrine, we understand the tree of life to be that which Adam and Eve were not able to eat from- though they did eat from the tree of the knowledge of good and evil. Therefore, the most high God loved his creation so much that he endowed them with the gift of free will; as he certainly knew even before he created them (Adam and Eve) that they would choose to disobey him- he still wanted them to be able to make the choice- and still intends to rescue them from their choice should they accept his love. However, he set an angel to guard the tree of life; that no imperfect creation could ascend to heaven while bearing the curse of sin. But in the esoteric world view, spirits can transcend between the Earth and heavens as long as they are properly enlightened. And even enlightened spirits still need “cleaning”, which is why at each of the seven spheres of ascension, there are demons present to “clean” off from them their various impurities. We can see where the masons would have borrowed these beliefs- from the ancient Egyptians, where only the illuminated Pharaoh and high priests were worthy to make their journey through the underworld and needed various schooling and tools at hand in order to make their journey a success. These beliefs also transcended into the Catholic church in the form of the idea of a place called purgatory- where spirits must be purified before gaining entry to heaven. When an illuminated spirit finally reaches its highest point of ascension, it then travels back to the Earth to be reincarnated again, hopefully to reach an even higher point of ascension at the end of another lifetime on Earth where it would have attained even more wisdom. So therefore this is the difference between the Christian view of the tree of life and the esoteric view. In the Christian view, it is available to everyone who asks and its only a one way trip- from the Earth to heaven to stay. In the esoteric view, its a divine link between heaven and earth transcended by only the most enlightened spirits in either direction and only available to the illuminated ones who have gained the required wisdom through secret societies and their teachings. The elite foist their beliefs blatantly upon the populace in a haughty arrogance which has existed since the beginning of man’s stay here on the earth. The attempted construction of the tower of Babel might be the earliest recorded event we know of this happening but the construction of the masonic wonderland called Astana is surely one of the most recent. For us to conceive that this is the first city to be dedicated out-rightly to the fallen one would be ignorant. 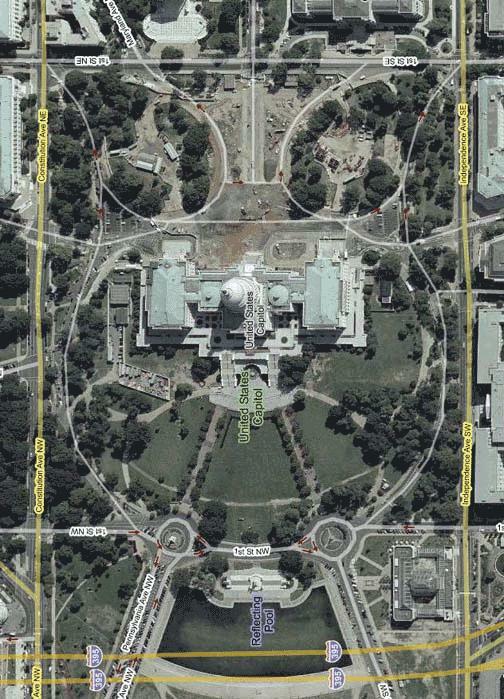 Washington DC, it is said, is laid out according to the street grid of Babylon and is certainly oriented and dedicated to the maiden of the heavens- Virgo. Virgo is Rome’s Minerva, Greece’s Athena, and Sumer’s Inanna. 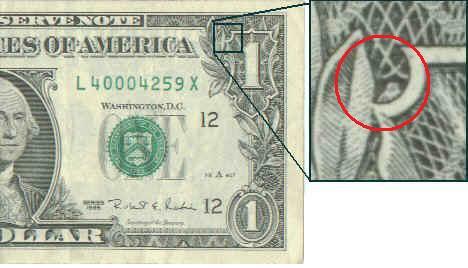 She is symbolized by the owl- and the owl is present i nthe top right hand corner of the dollar bill- and the US capitol building sits directly in the belly of the owl in Washington DC. The owl, symbol of Minerva, Athena, Virgo, and Inanna- the same goddess transcended many cultures over time, and one of the principal deities of each. The enemies of Israel mentioned in the old testament never went away and neither did their religion- they just became more clandestine, and consequently more powerful in a material sense. Most of the global conflicts are largely due to these people attempting to bring about their desired end game; a New World order where all the Earth is under the authority of one religion and one leader- just as in the days of Noah! The Bible is explicitly true and accurate. Many people say it is outdated or inaccurate- but those people, I would suggest, would be well “illumined” if they would study history in an objective manner through direct sources and not the propaganda that we are saturated with today. Love. not hate. Peace, not war. There is a better way which the main stream media refuses to talk about. Its not about Republican or Democrat or right or left. These are divisive labels created by the elite to keep use divided and powerless. It is about freedom, love, and watching out for our neighbors.